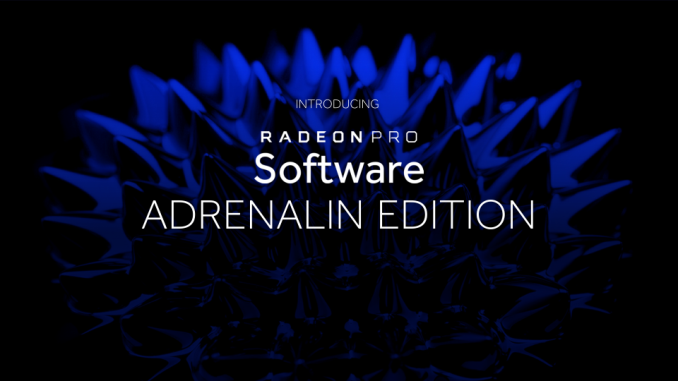 Alongside the much more expansive Radeon Software Adrenalin Edition, today AMD has released Radeon Pro Software Adrenalin Edition. 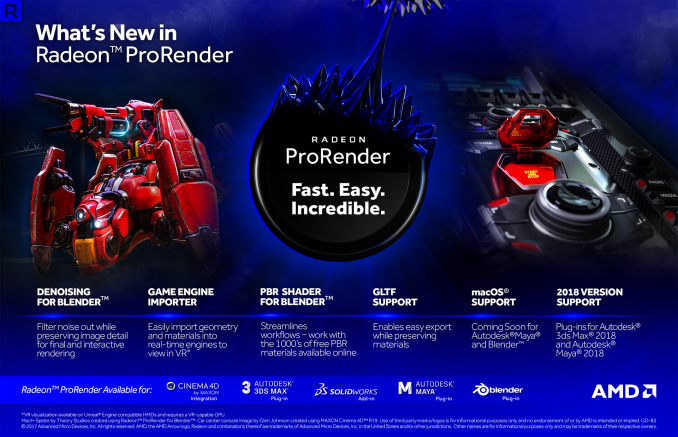 As implied by the name, 17.12.1 Pro includes Radeon Pro ReLive, Radeon Pro Overlay, and a Pro-oriented ‘Connect Tab,’ with the same functionality covered in our primary Radeon Software Adrenalin Edition article. Supporting Windows 10 Fall Creators Update and Mixed Reality, today’s release also brings a good number of ProRender updates, rounding out AMD’s professional driver take on Adrenalin. Additionally, AMD is announcing a change to the release schedule of Radeon Pro Software Enterprise Drivers. For 2018, release dates will fall on the 2nd Wednesday of the 2nd month of the quarter, instead of the 4th Thursday of the quarter. Subsequently, the first enterprise driver of 2018 will release on February 14th instead of January 25th. 17.12.1 Pro continues to offer the optional Driver Options feature, which allows single Radeon Pro WX or Radeon Vega Frontier Edition cards on Windows 10 to utilize Radeon Software gaming drivers. 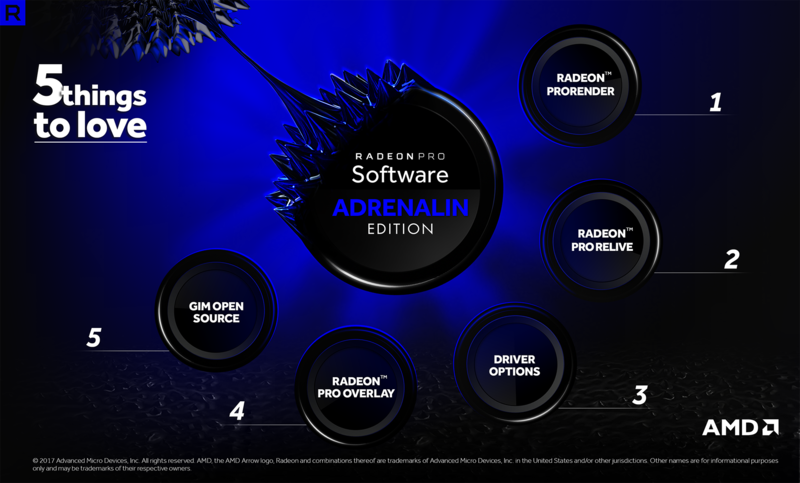 A specialized “Radeon Software Adrenalin Edition for Radeon Pro” driver is available for this purpose, and is downloadable from within Radeon Pro settings. Radeon ProRender has also been enhanced with several new features and updated plugins. 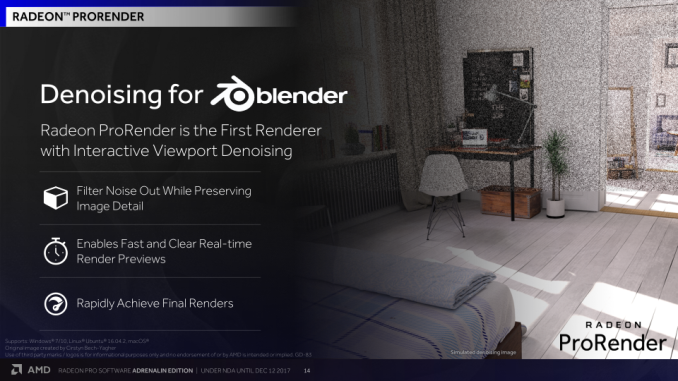 The renderer now has interactive viewport denoising, which can speed-up 3D render times, and GL Transmission Format (glTF) support, a Khronos Group specification that compacts 3D asset size while reducing the processing time needed to unpack said assets. 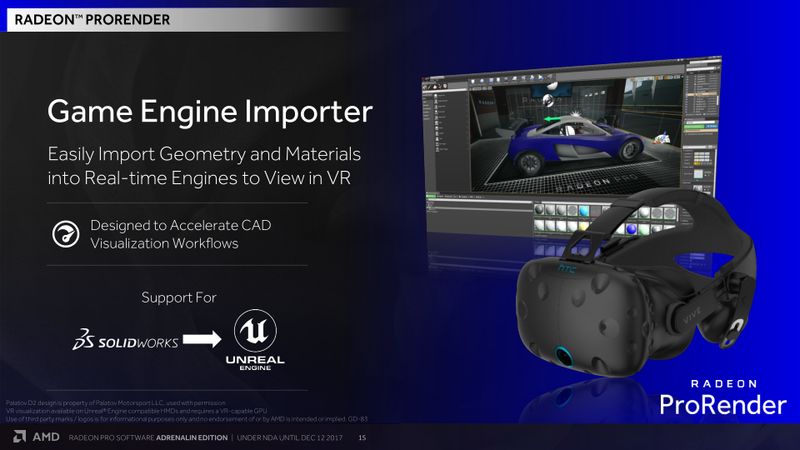 In turn, this assists exporting assets to other applications while preserving materials. Autodesk 3ds Max 2018 and Autodesk Maya 2018 are now supported by ProRender plugins, and AMD also pre-announced macOS support for Autodesk Maya and Blender. And ProRender now has ‘Game Engine Importer’ for importing Solidworks geometry and materials to Unreal Engine for CAD visualization in a VR environment. And touching on virtualization, AMD announced their new Guest Interface Manager (GIM) open source KVM host OS driver, and stated that it was available on GitHub. As listed earlier in 17.Q4, 17.12.1 Pro carries the same ISV certification notes in regards to Autodesk Maya 2017/2018 issue #41945 and Arnold to Maya issue #3142. ISV applications, certified drivers, and product compatibility are all listed on AMD’s ISV Application Certified Drivers page. The amdgpu-pro + amdgpu-all-open Radeon Pro Software Adrenalin Edition 17.12.1 for Linux also makes its mark today, and more information can be found on its release notes. The updated drivers for AMD’s professional workstation GPUs are available online at the AMD’s professional graphics driver download page. More information on this update and further issues can be found in the Radeon Pro Software Adrenalin Edition 17.12.1 release notes.